It has inspired works of art, including poetry, paintings and woodcarvings; made and destroyed immense fortunes, from the De Medici's in Renaissance Florence to Philip II's in 16th century Spain; it even sparked the French Revolution. It is not power, or money or love. This magic driver of history is, roll of the drums, the somewhat unintelligible, unexciting discipline of accounting. This, in a nutshell, is the rather persuasive argument presented by University of Southern California history professor Jacob Soll in his new book The Reckoning: Financial Accountability and the Rise and Fall of Nations (Basic Books, out April 29). "Capitalism and government, it seems, have flourished without massive crises only during distinct and even limited periods of time when financial accountability functions," Soll writes, explaining the key tenet of his chronicle of some 2,000 years of bookkeeping, inventories and auditing. A lesson that we have yet to learn in full if we consider how this story culminates in such present-day accounting scandals as the one that brought down energy company Enron in 2001 and in the murky dealings that led to the 2008 financial crisis. 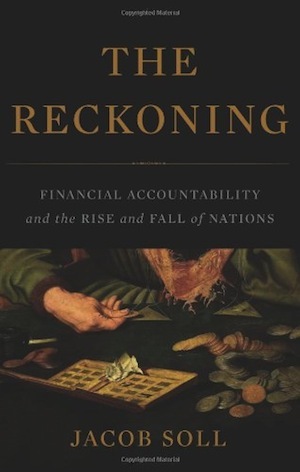 The Reckoning is a remarkable feat of research by Soll—who, in 2011, was the recipient of a MacArthur "Genius" award—though he skims so quickly through such large chunks of history that the book, at times, reads as a bit of a laundry list of names and events. The author credits the Roman Republic and the Roman Empire under emperor Augustus with an early interest in accounting-like practices and dates the birth of double-entry accounting , which he elevates to the discipline's purest form, to 14th century Tuscany and Northern Italy. "Without double-entry accounting, neither capitalism [nor] the modern state could exist, for it is the essential tool in calculating profit and loss, the basis of financial management," he writes. In Soll's retelling of history through the lens of accounting, somewhat obscure but endlessly fascinating characters take center stage. With their heads buried in numbers and ledgers, they made crucial contributions to the development of this practice and thus to the betterment of the world. Take, for example, the wealthy Tuscan merchant Francesco di Marco Datini, who built and managed a successful international trading firm in the late 1300s. "To see all of Datini's books together is to see the birth of modern finance and the information age," writes Soll. "Datini's books make him familiar: a businessman of numbers, data and paperwork." Or take Jean-Baptiste Colbert, who meticulously served Louis XIV, France's Sun King, as finance minister and was later praised for his work by none other than Adam Smith. Smith "admired Colbert, foremost for his skill as a financial manager, tax collector . . . and accountant," and lauded his "success in 'introducing method and good order into the collection and expenditure of the publick revenue.'" Soll's book is chock-full of valuable snippets of information. For example, that "the word 'audit' comes from a time when rulers and lords listened to, rather than saw, their accounts." And it makes a point of highlighting the still-unresolved tension between political leaders and their accountants: The former depend on the latter for their success but don't always want them too close, as good financial management and accountability allows societies to thrive but makes it more difficult for officials to meddle and use a state's finances as a tool for power plays. But Soll doesn't fail to notice the double-edged nature of accounting, not always a force for good. In fact, accountants have often been seen as having an ambiguous role, as "they could aid capitalism and government or, through cooked books, impede them both."